In the pole world, FITspiration has been prevalent long before the use of picture sharing sites such as instagram and pinterest. Pole dancers have been taking pictures of pole moves and sharing via social media to inspire each other for years. Through these images, we have grown as an industry including bringing awareness to pole dancing for fitness. FITspiration brings about a renewed meaning to the infamous quote, "A picture is worth a thousand words," -Napoleon Bonaparte. An image can mean so many different things and every observer will interpret the image differently. This is where FITspiration, although intentions may be good, can lead to very negative messages. The REEMBODY Blog points out six FITspiration themes that take this trend in a negative direction that promotes a dangerous mindset and culture in the article, The 6 Most Shockingly Irresponsible "FITspiration" Photos. 1. Does this image align with the concept I want for my body? 2. Is this a goal I feel I can achieve for my current level or body's capabilities? 3. Do I have the appropriate support to work towards this goal safely? 4. Is this image free of promotional measures that exceed my body's internal alerting system? Safety should be a huge consideration when looking for motivation. It's easy to see an image and want to draw inspiration from that image. A healthy image promotes healthy results by safe and healthy means. When using images as a business, I'm often looking for details that include proper form and technique. I feel like keeping these details in mind also keeps my business aligned with my mission of promoting safety to my students. It is through owning my own business and promoting fitness and health to others that I have become body conscious. I hope that through the use of tools that are available, others will benefit from drawing inspiration to heighten their body awareness and fuel their motivation to succeed. 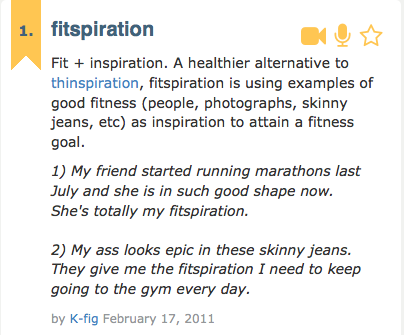 Continue the discussion: Are you someone who uses FITspiration? What kinds of FITspiration images do you use? Is there an overall theme to your inspiration, i.e. flexibility, tricks, strength?